Western blot analysis of extracts from LNCaP cells using AMACR (2A10) Mouse mAb. 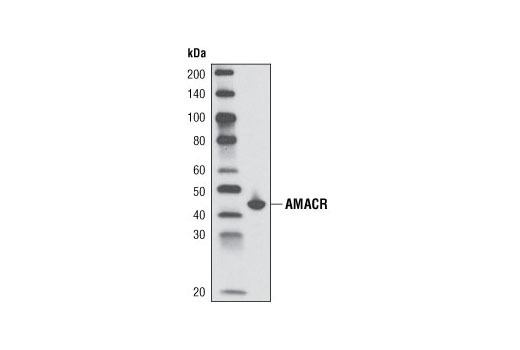 AMACR (2A10) Mouse mAb detects endogenous levels of total AMACR protein. Monoclonal antibody is produced by immunizing animals with a purified truncated recombinant human AMACR-His fusion protein. α-methylacyl-CoA racemase (AMACR), an enzyme localized in peroxisomes and mitochondria, is involved in the β-oxidation of branched-chain fatty acids and fatty acid derivatives (1). AMACR has been reported to be a biomarker for prostate cancer (2-4). The expression of AMACR is also related to other types of cancers such as hepatocellular carcinoma (1), noninvasive bladder cancer (5), colorectal cancer (6) and gastric adenocarcinoma (7). Li, W. et al. (2008) J Exp Clin Cancer Res 27, 2. Rubin, M.A. et al. (2002) JAMA 287, 1662-70. Jiang, Z. et al. (2002) Am J Surg Pathol 26, 1169-74. Jiang, Z. et al. (2001) Am J Surg Pathol 25, 1397-404. Gunia, S. et al. (2008) Virchows Arch 453, 165-70. Marx, A. et al. (2008) Virchows Arch 453, 243-248. Truong, C.D. et al. (2008) Int J Clin Exp Pathol 1, 518-523.